The joys of "foxhunting" highlight the April issue of CQ. 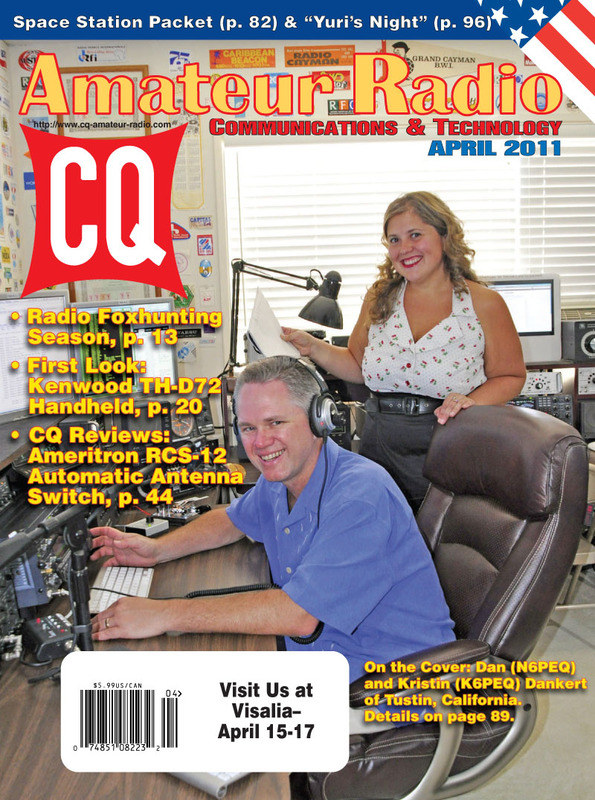 Spring is here and CQ World Wide Foxhunting Weekend coordinator Joe Moell, K0OV, offers tips on combining outdoor fun with radio fun while hunting for hidden transmitters in "Radio Foxhunting Season Brings Medals and Merriment" (this year's CQ World Wide Foxhunting Weekend will be May 14-16). Next, Contributing Editor Gordon West, WB6NOA, has our "First Look" at the Kenwood TH-D72A Handheld, featuring both GPS and APRS, the Automatic Packet Reporting System. (Click here to view a YouTube demo by W6GPS.) 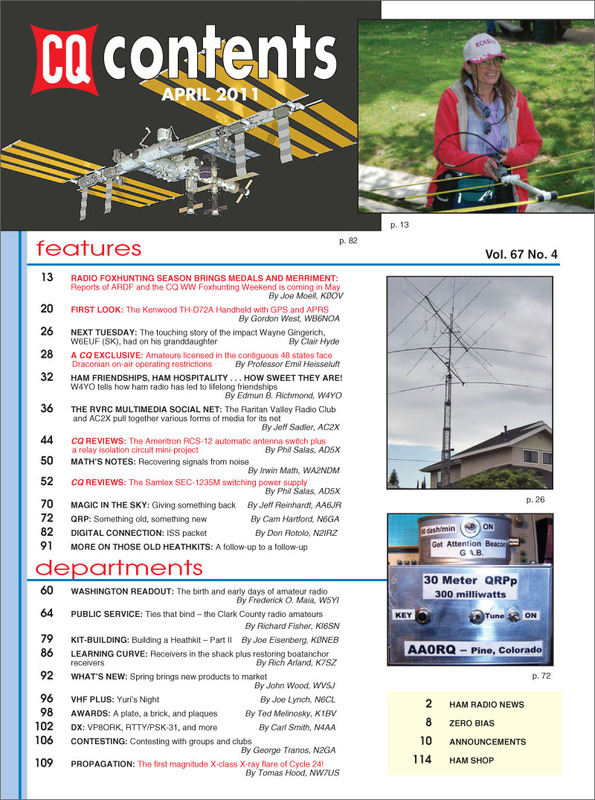 The article also includes a fascinating sidebar by APRS developer Bob Bruninga, WB4APR, on the many different uses for APRS. "Next Tuesday," by Clair Hyde, granddaughter of Silent Key W6EUF, chronicles the meaning to her of plans to dismantle her late grandfather's tower and antennas; Professor Emil Heisseluft make his annual April appearance with his report that "Amateurs Licensed in the Contiguous 48 States Face Draconian On-Air Operating Restrictions." Frequent contributor Ed Richmond, W4YO, shares his experience of meeting two long-time on-air friends in person for the first time, during a trip to England, in "Ham Friendships, Ham Hospitality… How Sweet They Are!" and Jeff Sadler, AC2X, fills us in on combining audio, text and video, along with RF and the Internet, on the Raritan Valley (NJ) Radio Club's Multimedia Social Net. 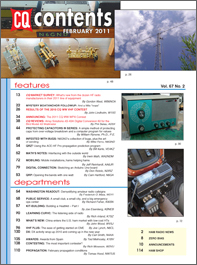 We have two reviews in this issue from Phil Salas, AD5X -- the Ameritron RCS-12 Automatic Antenna Switch (along with a mini-project to make a good product even better) and the Samlex SEC-1235M Switching Power Supply. Among our columns this month, "Math's Notes" editor Irwin Math, WA2NDM, has tips on "Recovering Signals from Noise;" Washington Editor Fred Maia, W5YI, covers the birth and early days of amateur radio, and Public Service Editor Richard Fisher, KI6SN, explores how hams in Las Vegas made headlines by having working communications "when all else failed…" in a major winter storm, and the carefully-cultivated relationships that allowed everything to function smoothly when their help was needed. "Magic in the Sky" columnist Jeff Reinhardt, AA6JR, discusses "Giving Something Back" to the hobby that has given us so much; QRP Editor Cam Hartford, N6GA, gives us "Something Old, Something New" in his April column, and Kit-Building Editor Joe Eisenberg, K0NEB, continues with his project of building a vintage Heathkit from the original box. Digital Editor Don Rotolo, N2IRZ, looks at packet radio aboard the International Space Station and how you can use the ISS as an orbiting digipeater; "Learning Curve" editor Rich Arland, K7SZ, looks at receiver basics and the basics of restoring an old "boatanchor" receiver, and "What's New?" by John Wood, WV5J, focuses this month on new products to help brighten up your springtime! "VHF-Plus" editor Joe Lynch, N6CL, reports on "Yuri's Night" - plans to mark the 50th anniversary of the 1961 flight by Cosmonaut Yuri Gagarin that launched man into space for the first time; Awards Editor Ted Melinosky, K1BV, looks at some unusual awards, including a plate and a brick(! ); and DX Editor Carl Smith, N4AA, reports on the VP8ORK DXpedition as well as the fun of DXing via digital modes. Our new Contesting Editor, George Tranos, N2GA, looks at contesting with groups and clubs, and Propagation Editor Tomas Hood, NW7US, reports on the biggest solar flare to date of Cycle 24 and the sunspot activity behind it. That's a brief look at what's coming up in the April issue of CQ magazine, which should be on newsstands and in subscribers' mailboxes by the end of March. For information on becoming a CQ subscriber, Click Here.